The 120th edition of the Paris Motor Show, also known as le Mondial de l'Auto, opened today (October 4) at the Expo Porte de Versailles. It will run until October 14, having kicked off officially with a display of vintage vehicles last weekend. The show itself is currently only open to members of the press and trade. The public will be able to visit from tomorrow. Among the exhibitors are several brands offering a range of new innovations for the future of cars and driving. Other innovations include more-sensitive GPS and navigation systems. Mercedes has created a system that both directs the car, and films the road around it while driving, improving navigation. Similarly, BMW unveiled an in-car screen that can be controlled by gestures in the air, rather than requiring the driver to touch a screen directly. Adjusting the volume for music or GPS voice, for example, can be done with a swipe of two fingers in the air in front of the screen, removing the need for the driver to take their eyes off the road to press a button. Mercedes revealed voice controls too - e.g. saying “Mercedes, I am cold” would see the car raise the temperature by 1C. The voice system can also call a concierge service, or even the emergency services if required. Remote-controlled parking was another idea to be exhibited this year. With parking spaces becoming ever narrower, brands such as Tesla and BMW have created remote-controlled systems, so the driver can exit the car before parking, and then position the car from the outside. BMW unveiled automatic reversing, which would allow the driver to tell the car to reverse for up to 80 metres automatically, along the exact route it has just taken forwards. This would make it easier to reverse down narrow streets in the event of an unexpected obstacle ahead, for example. Another innovation this year was the digital key from Volvo. A digital key can unlock, lock, and start a vehicle, and can be sent between phones. This means that a friend or family member could be given permission to use someone else’s car, without needing to physically have the keys. Similarly, the user can choose the exact times and days that the key would work, or turn it off for certain hours, improving security. Cars can now also be set up for extra safety and security, especially if the car has been borrowed. The owner can programme a car to stay within certain speed limits, and stay within a certain region or area. If the speed limit is broken, or the car strays outside of its geographic region, the owner receives an alert email automatically. Self-driving vehicles are taking centre-stage, with French brand Valeo testing its self-drive models on the banks of the river Seine as part of the Show. It is the first company to receive authorisation to do so in Paris, and says its technology is “90% ready” to be released to the public. It hopes to sell its first cars from 2020, and already has a number of anonymous buyers, it said. The Valeo models work by using ultrasound sensors and lasers just behind the car’s bumpers, and can be programmed for the precise rules of the road and the legal speed limit. Drivers must hold a separate license to drive a self-driving car, and still need to be alert to any unusual situations that may occur, requiring them to take the wheel. For example, during one test this week, a Valeo driver needed to avoid a broken-down car in the road, and did so by using the cycle lane - which is normally illegal. The car is programmed to strictly obey the rules of the road, so would not have performed this move itself, requiring the driver to take over. The driver said: “[The car] is programmed to obey the rules of the road, so it would never have made the decision to drive over a little kerb and use a cycle lane. It’s not allowed to do it, and never would." Guillaume Devauchelle, innovation leader at Valeo, explained that the cars were nearly ready to be sold commercially. He said: “Imagine the millions of hours saved, rather than always having to be aware of your vehicle, or feeling like you are wasting time [when driving]. 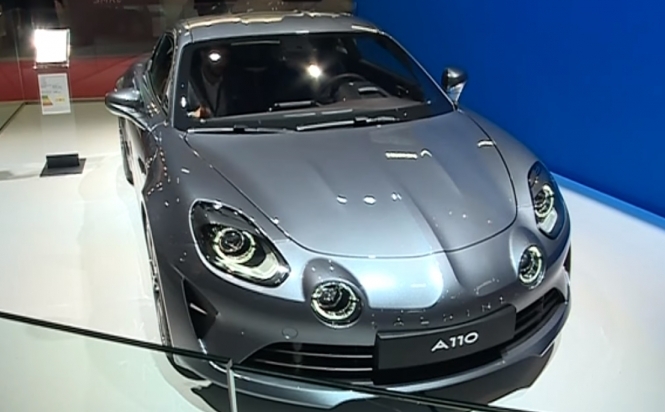 Alpine, the offshoot of the French brand Renault, created in Dieppe (Seine-Maritime), was also present at the Show, exhibiting its new model, the A110, for the first time ever in France. Alpine now sells cars in Europe and Japan, and hopes to go to Australia soon. It says 5,000 models have already been reserved. Sébastien Erphelin, director of the Alpine programme, said: “It’s a strange emotion. We are a French brand; we revealed the new A110 a year and a half ago at the Geneva car show in 2017. But this is the first time that we have been in Paris, in France, to share our passion with professionals and the public."